This is an extra Thursday issue of this webcomic. 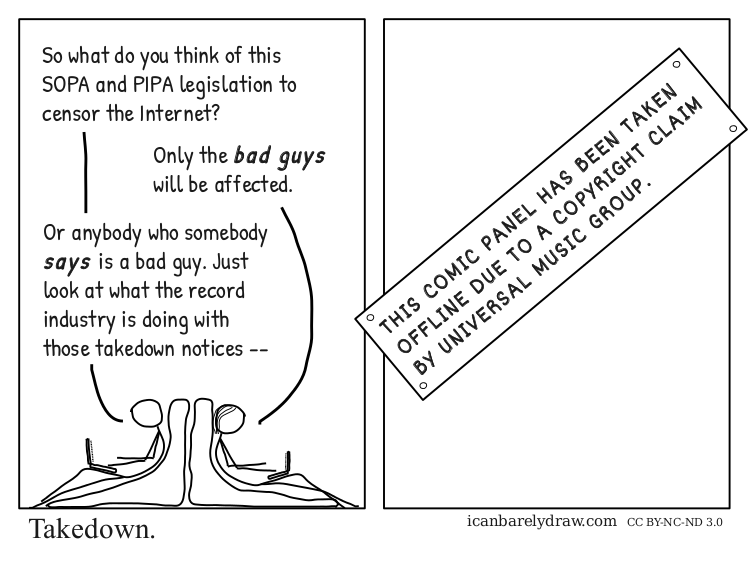 After this comic was posted, the name “Universal Media Group” was edited to correct it to “Universal Music Group”. Man: So what do you think of this SOPA and PIPA legislation to censor the Internet? Woman: Only the bad guys will be affected. Notice on 2nd panel: THIS COMIC PANEL HAS BEEN TAKEN OFFLINE DUE TO A COPYRIGHT CLAIM BY UNIVERSAL MUSIC GROUP.